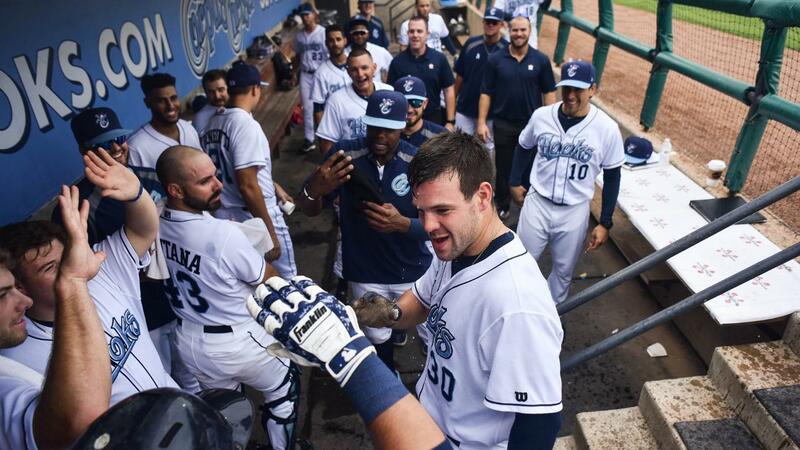 CORPUS CHRISTI - Behind early offense from Chas McCormick and a strong outing by right-hander Corbin Martin, the Hooks cruised to a 5-1 victory in Game 2 of the Texas League Division Series on Thursday night at Whataburger Field. Corpus Christi now leads the best-of-five series, 2-0. McCormick greeted San Antonio starter Emmanuel Ramirez with a leadoff home run to put the Hooks ahead 1-0 in the first. In the third, McCormick struck again. He sent a two-run shot over the left field fence to give Corpus Christi a 3-0 advantage. On the mound, Martin retired the first 11 batters he faced. The former Aggie dazzled over 5.2 scoreless innings, allowing just one hit and striking out nine on 98 pitches. Martin's performance was supported with a solo home run from Stephen Wrenn in the fifth. The Hooks led 4-0 after five frames. Ramirez went six innings for the Missions, allowing four runs on eight hits. In the sixth, Martin walked a batter and was replaced by Kit Scheetz. Scheetz wiggled his way out of the sixth and again escaped trouble in the seventh to keep the score at 4-0. Ronel Blanco entered in the eighth and proceeded to strike out the side. Corpus Christi tacked on another tally in the bottom half after Randy Cesar doubled and came around to score on Lorenzo Quintana's sac fly. Blanco gave up a solo homer to Austin Allen in the ninth. After walked a batter and allowing a single, he struck out Taylor Kohlwey swinging to end the contest. Randy Cesar was another offensive bright spot for Corpus Christi, reaching base all four times while collecting three hits and scoring a run. Ryne Birk also picked up a pair of singles. The Hooks are now a win away from securing their first appearance in the Texas League Championship Series since 2006. The series continues at Wolff Stadium in San Antonio on Friday night. The Hooks send righty Forrest Whitley to the mound while the Missions counter with right-hander Jesse Scholtens. First pitch is at 7:05 p.m.